Because of the scroll’s extreme fragility, the Israel Museum’s conservation team has mounted a unique exhibition using specially sealed construction developed in Israel, allowing total control of exposure to temperature and humidity. For almost a century, the Dead Sea Scrolls have enchanted people of every religion all over the world. Their dramatic discovery in the 1940s captured the public imagination, shedding light on the mystery and drama of the post-Biblical period and the Jewish people’s final centuries in the land of Israel. The Genesis Apocryphon is one of the original seven Dead Sea Scrolls and also one of the most mysterious. Due to its fragile condition, it’s been hidden from the public eye. Even standard room lighting could cause its crumbling parchment and delicate copper ink to deteriorate further. Now, the Israel Museum is offering a limited, once-in-a-lifetime opportunity to view this rare scroll thanks to a pioneering Israeli high-tech innovation. Thousands of years older than almost any other known Biblical manuscripts, the Dead Sea Scrolls have drawn millions to the Israel Museum’s iconic Shrine of the Book, which was designed to resemble the earthenware jars in which the scrolls were discovered. 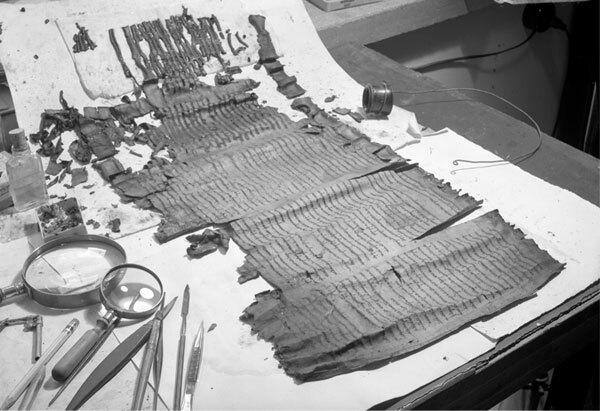 The Genesis Apocryphon scroll was dated to the end of the 1st century BCE. Written in Aramaic, the scroll relates elaborate legends surrounding Biblical heroes: Lemech, Hanoch, Noah, and Abraham. The section presented to the public tells the story of Noah’s sacrifices following the worldwide flood. Because of the scroll’s extreme fragility, the Museum’s conservation team has mounted a unique exhibition using specially sealed construction developed in Israel, allowing total control of exposure to temperature and humidity. The scroll is never directly illuminated; innovative “smart glass” technology turns the opaque glass transparent for 30 seconds at a time, allowing visitors to view the scroll while reducing light exposure by 50%, ensuring that the ink and parchment won’t deteriorate further. In its first few days alone, the exhibition has been full to capacity as Israelis and visitors from abroad line up for a chance to glimpse this rare specimen of the ancient past. In parallel with the Genesis Apocryphon display is a temporary exhibition called “The Faces behind the Scrolls,” which retells the story of the original discovery and introduces some of the men and women, Bedouins, Christians, Muslims, and Jews, who were instrumental in recognizing the universal historical and spiritual value of the Dead Sea Scrolls and ensuring they were preserved for future generations. These two exhibitions offer a once-in-a-lifetime chance to recapture the magic of the Dead Sea Scrolls for a new generation, an opportunity to view this rare and precious connection with the ancient world before the Genesis Apocryphon is returned to the Museum’s archives once again.